Update: The HSC folks were out with a stand at the Electronics Flea Market in Sunnyvale this morning (March 9, 2019). Signs and flyers noted that they’ve sold the store to Excess Solutions of San Jose. Should be interesting to see how the inventory is integrated. Update: HSC closed this past Saturday, January 12, 2019. There was an impressive crowd, cake and coffee, and last minute deals. Best wishes to the owners and employees for success in their next stages, whether retirement or different work. About 8 months ago, I wrote about the closure of Weird Stuff Warehouse in Sunnyvale, California. Well, Halted Electronic Supply/Halted Specialties Company/HSC Electronic Supply will joining Weird Stuff in the history of Silicon Valley in just about 6 weeks. Halted has been in business for 54 years now. The Homebrew Computer Club often visited back in the day (including both Steves). I wasn’t around the Bay Area for most of that time, but got an introduction early in my time here, in the late 90s. Around the turn of the century, Halted had three locations, with the main one being in Santa Clara on Ryder St, just off Central Expressway and Lawrence Expressway (near the Sunnyvale Frys, the pre-1996 Weird Stuff, St John’s Grill, and Ham Radio Outlet among others). Gradually the remote locations closed, and the Ryder store was left. Halted was known for components of all sorts, books and magazines for people who made things from those components, antique radios, tools, legacy computer components, and all sorts of other things. It wouldn’t be unusual to find people in the store with ham radio transceivers on, students buying components for an electronics class, people reminiscing about the radios they used to listen to during the war, and random bargain hunters looking for computers and electronics to mess with at home. They also had a well-known parking lot sale every September, where cases and crates and pallets would come out of the warehouse, hot dogs and donuts would be put out for sale, and you could get some incredible deals on things you’d forgotten you needed. And you could also find them at the Electronics Flea Market sometimes, with a truck full of carts from the store. Today was the first full day of Virtualization Field Day 2, with presentations by Symantec’s backup divisions (Netbackup and Backup Exec), and some of the higher-up tech minds from Zerto and Xangati. You probably know the disclaimer bits… these folks and our presenters tomorrow (Pure Storage, TrueBit.tv, and Pivot3) are sponsoring my presence (and the other dozen delegates’ presence as well) at Tech Field Day, providing for our lodging, transportation, feeding, entertainment, and the occasional trinket or sample software. While they do this out of the goodness of their hearts and their marketing departments, we are independent in our responses to the presenters, presentations, technologies, and trinkets. What you’re reading here is actually my take on things, what I want you to hear, and not necessarily what the presenters want me to tell you. We are grateful for their involvement, but we’re not required to blog or fluff or fold for them. I don’t believe in 7am most of the time. When I went to grad school, my earliest class all year was at 3:30pm. Not a morning person. However, we all showed up at the lobby Starbucks and caffeinated ourselves at 7:15am before heading for the vehicle to take us over to our first session. We’ll be up and caffeinating again tomorrow at 7:15am, but I have to say I’m looking forward to normal hours after that. Many of you know Symantec for their Peter Norton legacy, and the Norton Antivirus/Internet Security/Constant Guard/360 family of home data protection software. Those of us in the IT business know them as the more often mentioned backup solution for small and large enterprises. EMC still has Legato Networker, and that was my backup software of choice for most of my Solaris career (and aside from Rational ClearCase, my only actual formal certification–LCA1), but you don’t run across it as much, and I didn’t have much luck getting EMC to pitch it productively to me a couple of jobs ago when I needed something better than Windows Server 2003’s built-in backup package. So one way or another, Either Netbackup (NBU) or Backup Exec (formerly BENT) tend to be the front runner. Honestly, backup software is no longer my bailiwick, as most places I’ve worked in the last few years use alternatives to commercial backup systems. Configuration, code, and tools in version control/source control systems, as little local unreconstitutable data, and databases backed up via replication, master/slave, hotcopy, rsync, or some combination of the bunch. Generally these standards have applied to bare metal and VM data protection/busines continuance, so while I did try to get some backups going for the Windows environment at a green-logoed real estate search site in San Francisco back in the day, it’s been outside my focus for a while. We landed at Symantec’s World Headquarters/Executive Briefing Center and started in on NBU with George Winter, Technical Product Manager for that product line. To be honest, I didn’t get a lot from the presentation, which spanned about 3 1/2 hours and sixty Powerpoint slides, and some heated discussions with a couple of our VMware experts. I did see and like the NBU Accelerator, which does changed block tracking to improve non-initial-backup performance especially over a WAN. It chopped the time for a backup from multiple hours to multiple minutes. I didn’t really care for being lumped in with another delegate as “nobody” in reference to who has relatively low utilization on their virtualization systems. You can’t always run your VMware or Citrix servers at 80%+ even if your power supplies are rated for 80+… and if 20% of your relatively-small audience responds to a question, it would be polite to notice it, even if you don’t take it into consideration in your interpretation of the Powerpoint deck. I did feel that a Powerpoint Accelerator would have made a better impact on the delegates, as we probably could have gotten through the material in ten slides and an hour or so. Some of this deceleration came from the presentation, and some came from eager interruptions from some of the delegates… I’d put the weight more on the former but they definitely had help in slowing down. Next up were Kelly Smith and Gareth Fraser-King for the Backup Exec team, who got nearly half an hour if you include the time we had to grab lunch and take a bio break. I think they were short-changed, and hope to learn more about their line in the future. The two products, which aim at the high end (NBU) and lower end (BE) business scales, still have distinct teams, product roadmaps, development, and usually feature sets. So you may find a feature you want in the other product, and it may make it into your own product eventually. But they haven’t been combined, integrated, streamlined, or merged yet. The admin interface for Backup Exec certainly looked slicker than I remember from my chats with Symantec in 2008 or so. I found myself longing for a command line interface… but I think most virtualization people have been bullied into accepting a Windows system for management (Citrix, VMware, of course Hyper-V) so it didn’t seem worth mentioning at the time. As I mentioned, backup systems aren’t in my core focus these days, so while it would be nice to get more up to speed on the options and benefits, I couldn’t really come out of the presentation seriously yearning to try these products out in my labs. It’s important to know and play to your audience, whether it’s five thousand people checking their phones and playing Angry Birds in a convention, or a dozen seasoned professionals in a room wanting to be impressed and informed and maybe even confused once in a while. I hope that the folks behind the presentations from Symantec will work on their focus, and target future presentations to the present audience. When you have a majority of the room who are experts in the field they’ve come to hear you speak about, and multiple published authors and/or instructors on the topic in the room, you can probably assume that at least some of them know the basics already, and want to hear what makes your solution noteworthy and businessworthy. Working from that assumption makes it more likely that your audience will think that you “get” virtualization, or whatever the focus of the event happens to be. There’s a great page on the Tech Field Day web page about presenting to engineers that would be excellent preliminary reading for people wanting to talk to folks like us. Think about how you want to be remembered a month or six from now when we’re advising on (or making) an enterprise purchase, or even a day or six from now when we’re writing about our impressions. I’ll write about the afternoon’s presentations from Zerto and Xangati a bit later… these were moving more into the areas I have both an interest and a potential business need for. 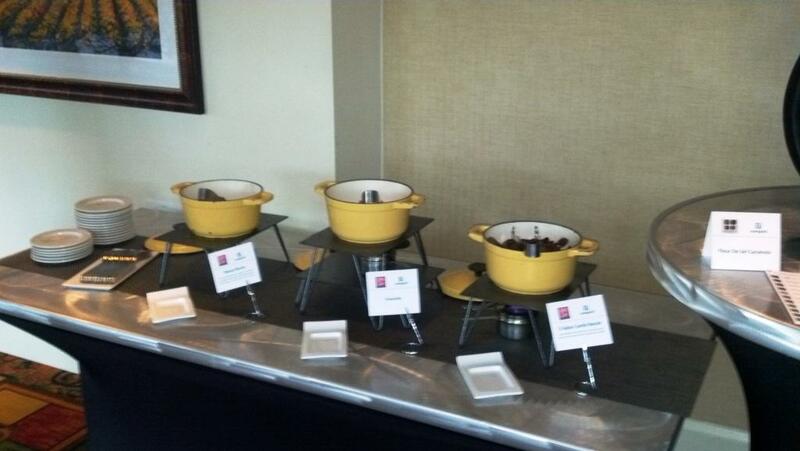 I’ll also explain the bacon bar pictured above. But for now, I have another cup of coffee and a pile of pillows in my near future. Thanks for visiting and reading. Greetings from the Silicon Valley representative/delegate to Virtualization Field Day 2 by Gestalt IT. In about 9 hours we’ll be on a bus/limo to the first presentations of #VFD2 (watch our updates throughout the rest of the week on Twitter!). We had our opening ceremonies/hometown gift exchange/thorough discussion of kangaroo scrotums (hope there wasn’t an embargo on those) and great dinner at Zeytoun across the road from our home base at the Doubletree. I won’t write much about the meal (although I will probably Yelp it later). It was fun getting to know and chat with the other eleven delegates and our fearless leader Matt Simmons (@standaloneSA). We’re missing Steve Foskett, but he had family priorities that meant it was right for him to miss his first of 14 TFD events. I have to admit it’s weird being the only one from Silicon Valley here. It’s easy to live in the Valley and feel like technology only exists here, or only thrives here. But we’ve got folks who make their living and livelihood at virtualization from across the country, across the pond, and somewhere that has a famous opera house on the other side of the world. So it can give a sense of proportion, although I am happy to have Fry’s, Central Computer, Action Surplus, Weird Stuff, and Halted within a couple miles of home, and most of the big names in technology nearby as well. I’m back in my room, and I think many of the delegates took the opportunity to get wound down for bed in their respective rooms across the hotel (we’re not the only geeks in the house — Ethernet Summit is winding down tomorrow it seems — but we’re not wearing name tags). I have to make some comments on the hotel experience, having spent some time in hotels in Las Vegas, Seattle, and Los Angeles in the last six months. The in-room coffee is, in fact, the best I’ve found yet. W Seattle and Hard Rock Hotel did not have in-room coffee, and LAX Marriott has weird disposable-brew-basket coffee that, while it tastes good, is really enough for one cup but they only give you one unless you ask. 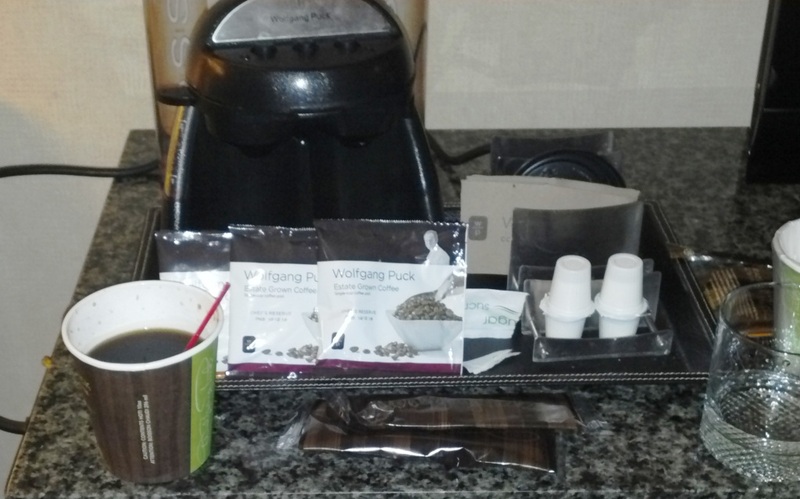 Doubletree is putting out a two-bay Wolfgang Puck branded pod-based coffeemaker that uses Senseo-style pods (Puck’s line is provided though, individually wrapped). There are two cups, two sleeves, two lids, and enough coffee and treatments for 2-4 cups. It’s probably not as good as I would have made with my Clever Dripper and some fresh-ground coffee, as I went for on my LA trip last weekend, but it’s pretty good, convenient, and drinkable even after Starbucks closes. Also, the service is excellent so far. I called their “careline” to get help with the wifi, figuring out how to get my free service provided as part of the reservation. It was explained promptly and courteously, and I even had time to add my Hilton number to the reservation before I got overly annoyed with the phone itself. 🙂 The people are great, greet you by name, and provide all the information you need (and a warm chocolate cookie at check-in too). I’ve already discovered a thing or two I’ve forgotten, and while I could drive home to pick up a few things, it wouldn’t be in the spirit of the event, so I’ll just rush to the lobby store in the morning… and be grateful I had a spare mini/micro USB adapter still packed from the weekend to charge my phone up. Tomorrow we’re off to see Symantec in the morning (did they really say we’re leaving the hotel at 7:30am? AIEEE), and then Zerto and Xangati will come see us in the afternoon. I’ve worked with Symantec in the enterprise antivirus/endpoint protection arena as a customer before, and have long used their Norton end user security products at home. Never got around to deploying their backup solutions (one of my two certifications ever was Legato Networker about a decade ago). Zerto is new to me, other than an amusing Twitter exchange last week… I met Xangati at Tech Field Day 5 over a year ago now as a fly-on-the-wall sort of guest, and am looking forward to seeing where they’ve come with their offerings. As you’ll see me mention a few times this week… the presenters/sponsors for VFD2 are providing for my lodging, meals, and entertainment over the next 48 hours, and may also provide gifts or promotional items. We definitely appreciate their support for this event. However, as Tech Field Day delegates, we’re not beholden to the presenters as far as content and perspective (or even reporting/blogging at all) by virtue of their generous support of the event. If something is interesting, noteworthy, yawnworthy, or downright unfathomable, you’ll hear it from me because it’s what I think, not because the provider of said something supported the event. If it’s just bleh, you may not hear about it at all, but hopefully that won’t happen. Same goes for the other delegates as well; we’re here as independent thought leaders, not cheerleaders (I’ll be the first to say I shouldn’t be wearing a skirt anyway). More tomorrow… watch Twitter for live treatment of the presentations, and check back on rsts11 for more detailed coverage as time permits and interest warrants.